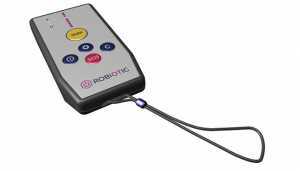 ROBIOTIC announces the availability of the MaidSafe Barcode Scanning systems that provides real time information regarding the status of room cleanliness & availability with a pocket size panic button for cleaning and room staff. Extremely easy to use, this small user-friendly device requires virtually no training. After the housekeeper scans a discrete bar code label on the room door or entranceway, the MaidSafe device automatically transmits the data to the hotel’s Property Management System (PMS) and booking systems via a mobile communication network, with a permanent “virtual dedicated line” that ensures constant connectivity. To verify the scan was successfully transmitted, the device can provide user feedback by LED, vibration, and/or sound, and gives the housekeeper the OK to safely enter the room and begin cleaning. The system instantly shows the operations and front desk teams that cleaning procedures have begun. When housekeeping leaves the room, they scan again, showing the room has been completed. As a result, the front desk can see an indicator of all rooms that are ready at any given time, ensuring guests need not wait longer than necessary to get into a clean room. MaidSafe ensures that operational staff can easily and ACCURATELY monitor which rooms need cleaning and can re-prioritize as needed, while also tracking cleaning metrics like time-to-clean. This information can produce better internal data to track cleaning times and identify gaps in performance, workers, floor routes, or inventory. Hotels can use this information to increase cleaning efficiency and productivity. In addition, MaidSafe provides a critical Panic Button capability. If housekeepers encounter an unsafe situation, they can push the panic button on the MaidSafe, which can attach to their wrists with a cord or fit inside a pocket so it’s always with them. The button push sets a chain reaction of events into motion, starting with messages to the security team, front desk, and potentially the alarm system (if desired). Since the device will have already scanned the room’s barcode, security will know the exact location and can send someone to investigate immediately. Even if no incident occurs, the device gives the housekeepers peace of mind and the confidence to focus fully on cleaning, without being distracted by fears of someone hiding in the bathroom or around the corner.